Arguably the most charming of Cambodia’s larger urban centres, we have hunted down some of the best boutique hotels in Battambang, so you can make this the small-town friendly town. It is home to some of the best preserved French architecture in Cambodia, but more impressive than the small city itself is the surrounding area. Travelling just 10 minutes out of town will take you into glorious rice paddies and provincial villages that offer a real insight into Cambodian life. We offer some wonderful excursions by bike, tuk-tuk or car to connect you with the local countryside and people of Battambang. In addition, no trip would be complete without a ride on the rustic bamboo railway (expect to hurtle through the countryside on a bamboo raft with a lawn-mower engine at the back on disused railway lines), or a trip to the bat cave at dusk where thousands of bats daily make their grand exit across the paddy fields as the sun slowly sinks behind the horizon. The surrounding countryside is beautiful and guests’ are guaranteed to see a slice of ‘real and rural’ Cambodian life in Battambang. Meanwhile, our favourite hotels, as described below, will only further enrich your experience. 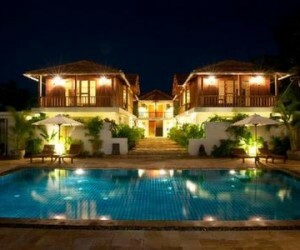 YBA001 - A charming mansion house with stylish finishing touches and large swimming pool in a central location in Battambang. YBA003 - Beautiful Khmer inspired wooden homes set in tropical gardens about 4km from the town centre of Battambang. 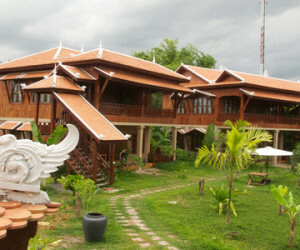 YBA002 - Tucked down a lane in rural Battambang, this smart and spacious resort feels like a jungle retreat. Located about 2km from the town centre.